Every parent aims to give his child a good college education. Through an education policy, parents are assured that no matter what happens, their child will have funds for a college degree. PhilamLife understands the real life needs of its customers and knows how important education is for its policyholders. The company has constantly delivered on its promises and has promptly released over P9 billion in education pay-out to its policyholders. To make education payout release faster and more convenient for its policyholders, PhilamLife launched the Direct Deposit payment facility—through which Scholar Gold policyholders will get their policy benefits credited directly to their bank account. 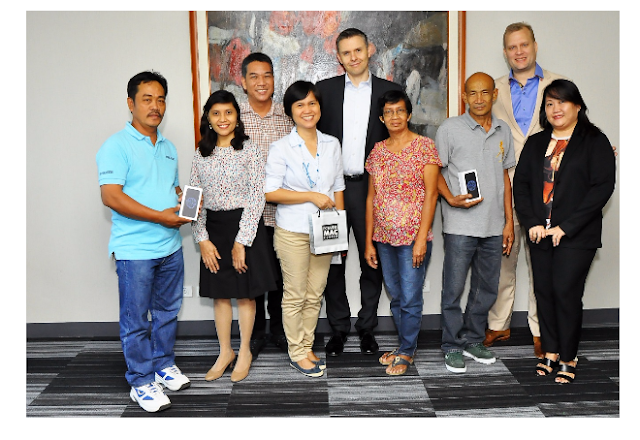 As part of the campaign to promote the Direct Deposit facility, PhilamLife recently held an electronic raffle promo to the early enrolees of the Direct Deposit facility by giving away brand new Apple iPhone 6 to five (5) lucky Scholar Gold policyholders. The winners of a brand new Apple iPhone 6 are: Juan Daoang of Pangasinan, Felicitas Evangelista of Malate, Manila; Melchor Mandadero of Parang, Marikina; Ammie Altavano of Angono, Rizal and Wilma Aquino of Pangasinan. One of the winners, Mr. Juan Daoang, who came all the way from Pangasinan, shared that he has Philam Life education policies for his three children. When he learned about the new Direct Deposit facility from his last visit to the PhilamLife Customer Service Center in Dagupan City, he immediately applied for it. Now with the convenience of the Direct Deposit facility, Mr. Daoang will be able to withdraw tuition funds directly from his bank account, without having to travel great distances. Another winner of the electronic raffle, Mrs. Felicitas Evangelista and her husband didn’t have a child of their own. Instead, Mrs. Evangelista invested in a PhilamLife Scholar Gold education policy for her nephew, Nathaniel, who is a third year Computer Engineering student at Bulacan State University. Because the Evangelista couple lived and worked in Manila and their nephew was in Bulacan, the responsibility of claiming the benefits went to Nathaniel’s grandfather. Since he is not the policyholder, he always went through the process of presenting authorization documents to claim the policy benefits. Now with the new Direct Deposit facility, the education benefits will be directly credited to Mrs. Evangelista’s bank account, which she can easily transmit to Nathaniel’s grandfather. “We understand the real life needs of our customers so we are shifting to paperless and online transactions. Thanks to innovative technology, we are able to give our customers like Mr. Daoang and Mrs Evangelista a faster and more convenient way to receive their policy benefits,” said PhilamLife CEO Axel Bromley. The Direct Deposit facility is just one of the ways that PhilamLife is undertaking to make financial planning easier for customers.